For this second post since “Howard on Mortgage Finance” went live, I thought I would start by briefly summarizing the goal of the site and addressing two possible concerns people might have about my motivations for creating it. The site’s goal is simple: to improve the quality of information available about the relative merits of various approaches to reforming the U.S. mortgage finance system. There is a large amount of misinformation currently being circulated on this subject, which in many cases my background and experience put me in a position to correct. Where I can I will try to do so. Few disagree on the basic objectives of mortgage reform: to develop and implement a capital-markets based secondary market system capable of financing very large volumes of 30-year fixed-rate mortgages, throughout the business cycle, for the largest number and the widest range of qualified homebuyers, at the lowest cost consistent with a defined standard of taxpayer protection. Where the disagreements arise is over whether other proposed features of the system—be they ideological imperatives or restrictions, or a prominent role for certain institutions or business processes—unnecessarily compromise the attainment of those objectives, at homebuyers’ expense. If only because of the lawsuits against the Net Worth Sweep, the current “indefinite conservatorship” of Fannie Mae and Freddie Mac is not sustainable over the long term. For both political and practical reasons, few support a formally nationalized secondary mortgage market. That leaves only two realistic alternatives: a system based on a reformed version of the entities we already have—Fannie and Freddie—or a de novo system, such as the one proposed in the Johnson-Crapo legislation. Between these, my knowledge and experience lead me to favor the former. I think it’s for valid reasons—many of which I will discuss in future posts—but I recognize that some may suspect that my views reflect a bias towards my former employer, or, as a holder of Fannie Mae shares, a financial motivation for advocating a future that would make those shares more valuable. I’d like to quickly address both concerns. The first is easy: the Fannie Mae that employed me for 23 years no longer exists. The aftermath of the 2004 “accounting scandal,” the subsequent dismantling of the credit risk management systems I helped put in place, the mortgage and housing bubbles, the 2008 conservatorship, and the mandatory shrinkage of the company’s mortgage portfolio all changed it irrevocably. There is no going back to the version of Fannie Mae I worked for; what is possible is to take the best features of that company—which I know well—and incorporate them into the system we design for the future. I do own shares of Fannie Mae (but not Freddie Mac). When I left the company I held common shares and vested stock options, all obtained as compensation there. On advice of counsel I sold no shares, and took shares (not cash) upon exercising stock options, until Fannie Mae completed its earnings restatement in December 2006. From January through June 2007 I sold approximately half of my and my family’s holdings of Fannie Mae common stock. I held the rest when the company went into conservatorship, and in August 2009 sold half those shares and used the proceeds to buy Fannie Mae series N preferred stock (picked because it was the last preferred stock issuance the company did when I was CFO). I have done no transactions in either the common or preferred shares of Fannie Mae since then. These shares now have little value. Having this value increase would be a pleasant surprise for me, but it is not why I have involved myself in the mortgage reform debate. Much more is at stake than that. If the past two years are any guide, Fannie and Freddie could release their fourth quarter and full year 2015 earnings as early as the end of this week. Now, therefore, is a good time to address the coming bailout charade that’s been set up by Treasury. With Fannie and Freddie currently permitted to hold only minimal amounts of capital (which will disappear entirely by the end of next year), a quarterly loss by either company could trigger a capital draw from Treasury. Already, we’ve heard critics of the companies claim that this further “bailout” will be a wake-up call about how truly risky Fannie and Freddie are, and why they must be replaced with a more stable mechanism in order to protect taxpayers. I doubt that either company will require a draw this quarter, but as more time passes and their capital gets closer to zero, the likelihood increases that there will be a loss at some point. If and when there is, the way commentators react to it will be a litmus test of whether they’re being honest with their audiences. Fannie and Freddie have simple business models. They have just three main sources of revenue—net interest income from their portfolios, fees on the mortgage-backed securities they guarantee, and relatively small amounts of miscellaneous income—and two main sources of expense, credit losses and administrative costs. Because both companies prudently underwrite the mortgages they purchase or guarantee, and closely hedge the interest rate and option risks on their portfolios (each of their “duration gaps” have been at zero for all but two months in the past two years), they typically have stable and predictable earnings on an economic basis. But the companies don’t report their earnings on an economic basis; they report them under Generally Accepted Accounting Principles (or GAAP). And since 2001, when a new standard for accounting for derivatives, FAS 133, was introduced, GAAP has required Fannie and Freddie to use historical cost accounting for some parts of their business and fair value (or “mark to market”) accounting for others. Post-FAS 133, the companies’ biggest financial risk—at least in normal times—hasn’t been interest rate risk, option risk or credit risk; it’s been accounting risk: the risk that the different accounting conventions the companies are required to use for assets and liabilities that are well matched economically will produce large and unpredictable amounts of GAAP earnings volatility on a quarterly basis (which, over longer periods, net to zero, or close to zero). It generally is not possible to hedge against accounting risk (although I do believe both Fannie and Freddie could, and should, look harder at the permissible accounting choices that exist for reducing the large swings in their quarterly GAAP net income). The only sure way to protect against it is to hold more capital. Prior to 2001, when Fannie and Freddie each were permitted to account for all of their business at historical cost, Fannie typically held about $300 million in excess capital, relative to its required minimum. I was CFO at that time, and just three years after FAS 133 took effect we felt it was necessary to boost our excess capital to nearly $3 billion at the end of 2003—predominately as a bulwark for accounting risk. Both companies’ accounting volatility has increased significantly since that time. On a normalized basis, Fannie should be able to produce annual pre-tax economic earnings of about $12.0 billion per year, and Freddie about $9.0 billion. That’s $3.0 billion and $2.25 billion per quarter, respectively. Soon those quarterly economic earnings will be the companies’ only defense against accounting volatility, and they likely won’t always be enough. If the Net Worth Sweep were annual, only the first quarter of each year would pose significant risk of an accounting-driven loss. But Treasury made the sweep quarterly (probably just for this reason), and that means the companies will have to be lucky every quarter. They very probably will not be. Commentators who call the next Treasury draw a bailout—or claim it reflects some fundamental flaw in the companies’ business model—either will be grossly uninformed or deliberately saying something they know not to be true. And those who say things like, “I understand what’s happening, but it’s still a problem because…” will be dissembling. They surely will know better, because they’ll know about the accounting volatility, and they’ll know about the Net Worth Sweep. Since the advent of mandatory central clearing (circa 2012), the losses on the derivatives positions are real. Fannie/Freddie have to wire cash to a clearing house to cover the losses and the clearing house wires the money the counterparty dealers. The dealers are free to spend the money as they wish. This is an enormous transfer of wealth to from the GSEs to, perhaps, five dealers. Prior to mandatory clearing, the GSEs could simply post collateral to cover losses — no cash was transferred. There is also no guarantee that the losses will be recouped when rates rise. If prepayments/defaults occur on the retained portfolio in falling rates, a portion of the derivatives position is liquidated. Thus, there is much less gain when rates rise. That the CEOs of Fannie/Freddie are unaware of this asymmetry is truly shocking. i find it curious, then, that fnma still discusses these derivative losses as “non-cash” in its financial disclosures. Your posts are very knowledgable and are much appreciated as was the filing of your brief. Can Mel Watt as Director of FHFA end the conservatorship without assistance from Congress or the White House? If so, where exactly does it state this in HERA and why doesn’t he do it? Max: Thank you for your comment. I don’t view myself as a legal expert (and have not actually read all of HERA), so I wouldn’t want to opine as to whether Watt legally could end the conservatorship on his own. What I have said in the past is that even if he could, the existence of the net worth sweep would make it impossible for him to do successfully, since the company cannot survive without capital. isnt the simplest fix to this accounting risk that creates the risk of future additional treasury draws simply to stop hedging interest rates? as interest rates go down refis go up, g fees as average go up and it is good for business, and there are no derivative noncash accounting gains for treasury to sweep. when rates go up the value of the outstanding g fee portfolio goes up (equiv to IOs), so happy day even though that is not marked to market. so in normal times, hedging makes sense, but in this conservancy, hedging only is adverse to conservatees. There is a distinction between hedging the interest rate risk (and option risk) of the mortgage portfolio, and hedging the interest rate risk of the credit guaranty (or mortgage-backed securities) business. When I was at Fannie, we didn’t attempt to hedge the interest rate risk of our credit guaranty business, largely for the reasons you note. We did try to hedge the interest rate risk of the portfolio. The latter is an economic risk, which one can and should hedge. Unfortunately, a byproduct of hedging the economic risk in the portfolio is that it produces accounting risk, which cannot be hedged. Having said that, though, it still seems to me that both Fannie and Freddie have more accounting risk than they “should” have, given that each of their mortgage portfolios has shrunk to less than $350 billion. I’m not sure why that is. One reason might be their choice of accounting implementations. I know that after I left Fannie Mae and the company was doing its earnings restatement, the Director of OFHEO, Armando Falcon, insisted that it adopt “the most conservative form of GAAP.” If Fannie (or Freddie) did that, it would produce a lot of accounting volatility. Using “the most conservative form of GAAP” is a choice, not a requirement, but if one or both companies have made that choice they might find it difficult to back away from it, even though it would be very much in the best interest of the conservatees, as you all them, to do so. How does it feel to be the man? I know the sweep has a strong case against it but what about the initial takeover? Is it possible to push for a criminal investigation? Do you believe there is any value discussing the history of these 2 companies. What they have done for our country. Who was in the room in the late 60’s, why they created Modern Flow Through MBS to begin with and why there is not a better idea? James: I think there’s already a lot of good information on this subject out there– including (shameless plug) in my book. The problem is there is far more misinformation, and it’s more widely disseminated and readily available. But the more people we have writing accurately about this topic, the faster the balance between good information and bad information will shift. Thanks again for all you are doing Tim. For the record, I am most definitely rooting for the plaintiffs. Long going on 5 years now actually. For what it is worth I have also, since your first post on the matter, referred others to read your take on the issues for a true picture of what is going on here. I would say your first post [Jan 2015?] was the first time many started to “get it” start to current date. Regardless the outcome I thank you sincerely for your educating myself and others. You say above “Fannie should be able to produce annual pre-tax economic earnings of about $12.0 billion per year”. Fannie has pretax income of over $21B in 2014 (and i didn’t notice any extraordinary items like bank settlements of putback) litigation. Why in your view should one expect annual fannie earnings going forward to be down over 40% from 2014? My $12.0 billion figure was based on a rough estimate of the basic earning power of Fannie Mae’s two businesses (not a line-by line analysis of any quarterly or annual income statement). Currently, Fannie Mae has about $2.8 trillion in outstanding credit guarantees, on which they earn a net fee (i.e., after paying the government 10 basis points on loans guaranteed after April 1, 2012) of 44 basis points, for total guaranty revenues of about $12.0 billion per year. Estimating the earnings power of Fannie’s portfolio is trickier (because of the accounting), but excluding the guaranty fee component (already counted above) and assuming no interest-free funding (because of the Net Worth Sweep), I’m figuring they earn a spread (average economic interest income less average economic debt and derivatives cost) of about 80 basis points, for earnings on their $345 billion portfolio balance of about $2.8 billion. Their annual administrative expense also is about $2.8 billion, so those two figures wash. Miscellaneous income isn’t really significant, and at the moment Fannie isn’t adding to its loss provision. So…netting all those gets about $12.0 billion in fundamental earning power. That will change over time, but here it becomes murkier. The portfolio business is running off, so income from that source will decline. Outstanding credit guarantees should continue to grow, although that growth slowed notably in 2015. And the average effective guaranty fee should rise– as the fee Fannie is charging on new business is higher than the fee on loans that are liquidating, and also higher than the average fee. BUT.. Fannie is doing more risk sharing deals on which it is ceding a significant amount of fee income and not getting any current benefit (and probably not much future benefit either). And at some point it will need to start adding to its loan loss allowance again. Each of these components has its complexities, so I may do a post that discusses them in the not too distant future. thanks for reply tim. i agree that is a good back of envelope analysis, and we will see 2015 results on friday. i would think that the guaranty fee could be raised further, inasmuch as the incremental cost can be passed on to the market without substantially affecting liquidity, and this would make the whole notion of crowding out potential competition less of an issue…and would make GSEs more of a cash cow for the govt. if the GSEs are ever “liberated” wouldn’t you agree that the core earning power of GSEs could be materially greater than now without undue risk? If Fannie and Freddie are “liberated,” their guaranty fee pricing will largely be driven by the amount (and type) of capital they are required to hold. And if they are brought out of conservatorship under a “utility” model– which I think has the potential to provide workable solutions for several problems related to the government’s role with the companies–their guaranty fee pricing also will be limited by their return on capital guidelines. All of that is distinct from the issue of riskiness, which will be driven by the companies’ underwriting standards and the types (and the effectiveness) of the reinsurance they do. Would like to know your opinion on the impact of Mel Watt’s speech of Feb 18 on the GSE NWS. Thank you. I think having Watt publicly note his concern about the declining capital buffer of Fannie and Freddie due to the Net Worth Sweep–and the potential this might have at some point to cause a draw by one of the companies because of accounting volatility–is a good thing. 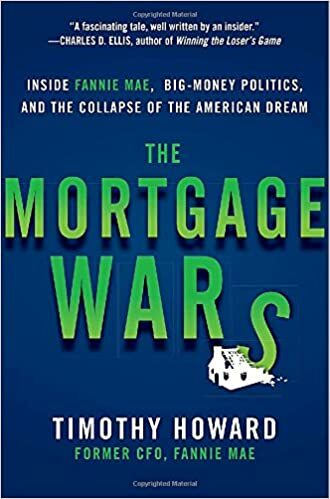 The more this subject is openly discussed, the less likely it is that opponents of the companies will be able to use such a draw to get Congress stirred up to enact some hasty and unwise version of mortgage reform. But I doubt Watt’s remarks will have any effect on the Net Worth Sweep itself–or, to be more precise, on Treasury’s continued support of the sweep. As an aside, I did find it curious to see Watt talk about the Sweep as if FHFA had had nothing to do with its implementation. I understand that he can’t criticize his predecessor for having gone along with it, nor can he say it was Treasury’s idea, but acting as if it is something that just “exists” struck me as odd. Would like to know if you have the answers to some of these questions: Do you know which entities are currently purchasing the mbs portfolio of Fannie/Freddie? We know the fed reserve is purchasing the bulk, do you know the discount of their purchase in relation to the book value? Do you believe they are purchasing quality? Maybe you can expand you knowledge upon the de facto wind down and liquidation of their portfolios. I don’t have anything detailed about who has been purchasing Fannie Mae MBS (or Freddie Mac PCs), or the prices being paid for those purchases. I only know what’s in the information the companies release publicly. When you ask if the Fed is purchasing “quality,” they’re purchasing securities Fannie or Freddie have guaranteed, so barring violations of the representations and warranties the underlying collateral will be loans that met their underwriting standards. Loans in securities guaranteed in 2006, 2007 and 2008 were riskier than loans in other years, but all Fannie Mae MBS and Freddie Mac PCs carry the same corporate guarantees, which, now that the companies are profitable again, are solid. For the portfolio liquidations, in recent years that’s mainly happening through the companies allowing amortizing, refinanced or repaid loans to run off un-replaced. Last year both Fannie and Freddie sold almost the same volume of whole mortgages they committed to purchase– Fannie committed to buy $916 billion and committed to sell $926 billion (as MBS); Freddie committed to buy $230 billion and sold $224 billion. Are you saying you don’t expect the preferred to reach par value? Thanks for sharing your thoughts on this blog. I make it a habit not to try to predict things that aren’t predictable. The complex mix of politics, personalities, money, law, finance and ideology that currently are swirling around the issue of what to do with and about Fannie and Freddie make a large number of outcomes possible. I certainly can envision outcomes that would result in the companies’ preferred stock reaching par; I also can envision outcomes that make that preferred stock worth zero. While I can’t predict which will happen, what I can do is work to get accurate facts incorporated into the discussion, in the hope that doing so helps get to a resolution that is in the best interests of the greatest number of legitimate stakeholders. How realistic would it be for the US Government to pit Fannie / Freddie into a receivershIP in 2018? After all that has transpired in conservatorship, the GSE’s are still engaged in growing their lending / securitizations? Michael: I am not a bankruptcy lawyer (and if someone reading this is, feel free to comment on or correct what follows), but I believe it would be highly unrealistic for Fannie and Freddie to be put into receivership at any time in the foreseeable future, for one simple reason: there is nothing to replace them with. In 2015, Fannie and Freddie together issued over $900 billion in new mortgage-backed securities. My understanding (perhaps incorrect) is that a receiver would cease the companies’ current operations– i.e., stop issuing new MBS– and begin liquidating the nearly $700 billion in mortgages and MBS Fannie and Freddie still hold in portfolio, at a pace intended to maximize the proceeds to the benefit of creditors. Who would step in and absorb $900 billion in newly originated whole mortgages following the receivership, or buy whatever amount of Fannie and Freddie whole mortgages and MBS the receiver elects to sell? In Johnson-Crapo, there is a lengthy section (Title VI) dealing with the wind-down of the companies during a transition to the new mechanism proposed in that legislation. I think this section– with all its provisions for making mid-course corrections after the process is initiated– still significantly underestimates the challenges and complexities of moving from a proven system of financing fixed-rate mortgages to an untested alternative. Eliminating that same proven system through receivership, without any envisioned alternative, would be folly, and therefore almost certainly won’t be attempted. In your amicus curiae you state that FHFA elected to pay cash dividends to Treasury which caused $36 billion in circular draws and further ballooned the bailout amount. From reading through several other documents pertaining to these lawsuits it seems that the actual dollar amount of circular draws that added to the $187 billion in total monies received doesn’t seem to be well defined. For instance, I have seen $26 billion up to $55 billion as the figure for circular draws. I am curious to know what your thoughts are on why there isn’t a clear consensus on the actual dollar amount. Thanks. Your confusion about three different numbers purporting to describe the same thing is understandable. Let me see if I can clear it up for you. The $55 billion number isn’t anything (I’ve seen it elsewhere, and have no idea where it comes from). The $26 billion figure is one Treasury likes to use: it is the dollar amount of draws of senior preferred stock (SPS) by Fannie and Freddie that was specifically tied to dividends paid during a given quarter. But since Freddie paid $9 billion, and Fannie $1 billion, in SPS dividends out of their retained earnings, the companies paid a total of $36 billion in SPS dividends during the period (second half of 2008 through the end of 2011) that they were drawing senior preferred stock from Treasury. That may seem like hair-splitting, but it’s an important distinction. Irrespective of whether SPS dividends were paid out of retained earnings or through draws, the amount Fannie and Freddie ultimately had to draw from Treasury was higher by the full amount of those dividends. Put differently, had it not been for the $36 billion the companies had to pay in SPS dividends, Fannie and Freddie today would have $151 billion in senior preferred stock outstanding, not $187 billion. 2. To what degree do you think foreign investment in Fannie and Freddie may be a part of the large number of Executive Privilege claims by our government and the terms or even need for conservatorship? Generally speaking, how do you think foreign investment in FnF have effected where we are today with Fannie and Freddie? I don’t believe foreign investment in Fannie and Freddie had anything to do with the government’s executive privilege claims; I think those claims are a pure stalling tactic (which so far has worked very well). It’s less clear whether concerns about foreign central bank ownership of Fannie and Freddie debt and mortgage-backed securities entered into Treasury’s decision to put the companies into conservatorship. They could have. I don’t rule out the possibility that during the summer of 2008 the Bush administration (including Treasury) may have feared that, with the private-label securities market having imploded, shareholder-owned Fannie and Freddie– as the only significant source of mortgage financing in a rapidly deteriorating housing market– might have struggled to provide the requisite amount of support for the market, with their equity, debt and MBS all coming under pressure as a result. Given the large foreign holdings of the companies’ securities, that would have had significant ripple effects throughout the global financial system. But even if we give Treasury the benefit of the doubt on that, there is no excuse for the confiscatory terms they unilaterally imposed on Fannie and Freddie post-conservatorship. Those had nothing to do with financial market stability, and everything to do with attempting to achieve Treasury’s longstanding objective of removing the two companies from their positions as the foundations of U.S. secondary mortgage market financing. First off, thank you for a fantastically awesome post! “…But even if we give Treasury the benefit of the doubt on that (large foreign holdings of the companies’ securities, significant ripple effects throughout the global financial system, etc), there is no excuse for the confiscatory terms they unilaterally imposed on Fannie and Freddie post-conservatorship. Those had nothing to do with financial market stability, and everything to do with attempting to achieve Treasury’s longstanding objective of removing the two companies from their positions as the foundations of U.S. secondary mortgage market financing. This statement above makes logical sense. While I suppose that a foreign investor in the companies’ debt securities would be calmed by some of the conservatorship acts in order to ensure that their investments remain productive, would not their “soulagement” be offset about the plummeting FNMA share price as well? That’s why this whole foreign holdings risk excuse never made sense to me. If there was no true market disaster scenario involving foreign holdings, and the thousands of protected documents are supposed to be protecting information that the public is not supposed to know/or does not know, would you be in position to speculate about exactly what information is contained within those protected documents that the administration is trying to keep from the public? Is it something as simple as trying to avoid throwing some famous individuals (from both sides of the aisle) under the bus – and perhaps leaving it for the next administration to deal with? The NWS discussions must have had some references to Hank Paulson’s conservatorship scheme as well as “background information”, n’est-ce pas? Would it be political fair play during this election season for Mr. Obama to call out Hank Paulson for an illegal seizure of a private company while Obama himself is simultaneously taking advantage Paulson’s scheme to milk it for Obama’s (and supposedly taxpayers) benefit? John: Merci pour ta commentaire; voici ma reponse: On the foreign investments, Treasury’s main concern was the “implied federal guarantee” of Fannie’s and Freddie’s debt and MBS. There was no such implied guarantee on the companies’ equity, so having the stock price drop to near zero following the conservatorship was of no concern to Treasury (and probably of some satisfaction). As to what the government is trying to achieve by insisting that so many documents should be subject to a protective order, I’ll give you my personal opinion, and it’s nothing more than that: I think they’re just trying to buy time– either for something favorable to happen, for them to figure out what to do with the mortgage finance system over the long term or, failing either of those, to kick the can down the road for the next administration to deal with. One of the ironies of my being denied access to the protected documents is that Cooper & Kirk really didn’t need me to interpret what was likely to be produced. There’s nothing subtle about what Treasury did. I doubt there will be any “smoking gun” document (for some reason, those frequently find a way of disappearing), but the sheer volume of documents that are consistent with what we all now know Treasury was up to will be compelling to a judge or jury. I believe the government knows this, and is now simply trying to string these cases out for as long as it can (although that won’t work nearly as well in the Delaware suit). As to what the Obama administration might do, my read as of now is that (a) this is not yet a “top of mind” issue for any senior administration official, (b) reforming the mortgage finance system is a knotty problem that no one there currently is eager to take on, and (c) the overwhelming majority of financial people on the President’s policy team are not fans of Fannie and Freddie, and would be reluctant to endorse any fix to the system that includes them. A ruling in one of the lawsuits against the government may change this dynamic, however; we’ll need to wait and see. Hi Tim. Thanks for the information on this blog — your insight is valued. 1) You ponder whether any senior Admin official has these issues on the top of their mind/agenda or if any official is eager to take on mortgage finance reform. However, Jeff Zients, Director of the National Economic Council (and Mike Stegman’s boss at the WH) appears to be an Admin official who is focused (albeit out of public view) on mortgage finance reform. My assumption is based on reviewing the WH visitor logs for Mr. Zeints who apparently meets frequently with two groups — a) HUD/FHA and b) banks & PMI companies. Would you please comment on the likelihood of the Admin trying to squeeze Fan/Fred out of the middle of the market by expanding FHA/Ginnie Mae’s portion of the lower end (more risky) of the market while expanding banks/PMI portion on the top end? How does the CSP play into this scenario and is the CSP development pace a partial reason for delayed reform implementation? 2) Why do you suppose The Honorable Melvin L. Watt isn’t doing his job (and why isn’t FHFA OIG holding him accountable)? I have no doubt that Mr. Zients (whom I don’t know) and others in the administration are working behind the scenes on mortgage-related issues. I also think there’s little doubt that their current focus is on finding non-legislative ways to reduce the roles of Fannie and Freddie in secondary market financing, and increase the roles of “private” entities, such as banks and PMIs. (As I’m sure you know, there are legitimate questions as to why too-big-to-fail banks and bailed-out PMIs should be considered private, but that’s not the topic here.) I believe the administration’s support for the common securitization project and Fannie’s and Freddie’s credit risk sharing deals is based on the notion that these activities somehow are paving the way for an ultimate transfer of the credit guaranty function away from Fannie and Freddie to these “private” institutions. But to replace Fannie and Freddie, these entities at some point would actually need to step up and take 30-year fixed-rate mortgage credit risk, on a mammoth scale, themselves. How and when that will happen is being left unsaid, at least publicly. And I continue to believe that having specialized institutions like Fannie and Freddie, limited just to the mortgage market and committed to serve it at all times and under all conditions, will produce much better results for homebuyers, our financial system and the economy, than turning the secondary market over to the banks, PMIs or de novo institutions. As for Mr. Watt, I think he knows the White House, and Treasury, are calling the shots on Fannie and Freddie–as has been the case since 2008– and that he has limited scope for truly independent action. And I suspect the FHFA OIG understands that as well. Thanks Tim. This example is one more where the administration usurps congress via executive action. Even the “wind down” reduction that is based on a monopoly break-up theory should be administrated through the courts if Standard Oil and AT&T are precedents. If there is a time you feel it is OK to give your opinion on why Judge Sweeny denied the plaintiffs request to have you officially on their team I would be interested in your comments regarding that action. As always, thank you for sharing your time and expertise. I am a FNMA/FMCC shareholder of four years now. HaloHat: I’ll admit I was surprised at Judge Sweeney’s ruling in favor of the government’s motion to deny me access to protected information in the Court of Claims case. I thought Cooper & Kirk wrote a strong brief addressing and effectively countering their substantive arguments. (The judge did not ask for oral argument, but if she had Cooper & Kirk would have made the further point that in the eight years I was a defendant in civil litigation I had access to huge amounts of information marked privileged or confidential– some of it exculpatory–and no one ever had suggested I’d treated any of it improperly.) I don’t know why Sweeney ruled as she did, but if I had to guess I would say she was being cautious not to show any signs of skepticism about the government’s vehement assertions that the information they would be designating protected was extremely market sensitive. I thought those claims were ludicrous, but I’m not the judge. From her perspective, since the government was saying it was so worried some of the information might get out, she may have felt it was a better choice not to grant me access– and thus avoid possibly sending a signal that she didn’t take the government’s fears seriously– than to rule in my (really Cooper & Kirk’s) favor. And if you’re rooting for the plaintiffs in this case, you should be glad she made that call; it’s one less ground for appeal. I love your posts. After reading this one I wanted to ask why you’re perpetuating the taxpayers narrative that comes from Treasury and anyone who is on their propoganda machinne team. I’ve read the latest legal filings and I have to say, it sure looks like tax collectors are stealing from taxpayers, making taxpayers borrow from other taxpayers to pay tax collectors, trumping capital structure, violating established insolvency issues, turning insolvency accounting into a liquidity crisis, committing accounting fraud, putting out false testimonies into the public regarding the facts, etc. Yes, it’s a current cost to taxpayers, but only because taxpayers already have benefited from tens of billions of dollars of the companies’ previous earnings. Best wishes. You’re my hero Tim. Glen: I agree with you that it’s a stretch to see how taxpayers “benefit” from the net worth sweep, certainly in the short run. One could argue, however, that because the money Treasury is sweeping from Fannie and Freddie is being used for general expenditures, the sweep benefits taxpayers in the long run by lowering the annual budget deficit, thereby reducing pressure to raise taxes. But the real reason I said in the post that taxpayers “benefited” is that I wanted to set up a clear equivalency between those who will be said to be bearing the cost of any future draws from Treasury, and whomever has been the monetary beneficiary of the net worth sweep up to this point. It’s the same group– whether you call them “the government,” “tax collectors,” or “taxpayers.” Fannie and Freddie’s critics will say it’s the “taxpayer” funding the draws, so I want to make clear that this same group already has benefited enormously from the sweep, and that having to give a little of the money back– and then only temporarily, until the accounting volatility reverses itself– still leaves them way ahead.